In true pedagogical 'let's continue to raise the bar' nature, English teachers Cathy Scheffelin and Bill Martino were looking for something more for their sophomore honors students. The classes had been working on Shakespeare’s Macbeth, and there was a feeling of 'been there, done that" in terms of students presenting what they had learned after reading the play. So, they did what KO faculty do best: They collaborated, innovated, and created. The task? To become the “walking shadow” (an Elizabethan term for an actor) and to bring a scene(s) alive, to elucidate the significant meaning in Shakespeare’s play. Students identified central conflicts, themes, character types, and symbols in Shakespeare’s scene(s) and then decided how they adapt this information by adding new context to scenes, new characters or changing the setting. The teachers encouraged creative license to add, tweak, or enhance scenes to depict a different setting or time based on their vision. One guideline was that 90% of the content remained true to the original language of the play. Students were split into groups and each was given a handful of hand-selected scenes central to the play. Using this collaborative approach allowed students to dive deeply into the text to understand a scene before they were able to accurately and convincingly abridge or modify it, and then present it. Character development was also that much richer. Take Act IV, scene I where Macbeth’s destiny is in question and he receives three prophecies. The Witches' commiserate around a bubbling cauldron, adding poisonous ingredients to their spell. The group presenting this scene framed the scene to take place at (tongue in cheek) The Boiling Cauldron, a bar establishment, where the witches gather to a confused Macbeth as he sips on pints. Or take Act V, Scene I where a psychologically mad Lady Macbeth is sleepwalking, recalling fragments of a string of recent murders and overheard by a doctor and patient. 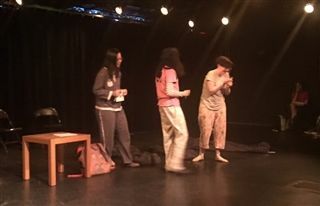 This student trio altered the setting to be acted out as “an awkward sleepover,” where the sleepwalker is moaning and fretting as they watch and try to decipher as fellow (confused) sleepover pals. 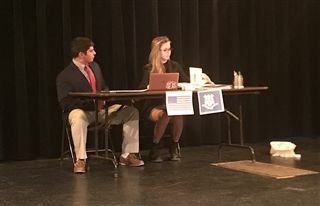 Students brought props, dressed to support the scene they acted out and utilized the Black Box theater to present their final renditions which added a nice theatrical backdrop. “It was different and fun and the students enjoyed the novelty of it. It was also a challenging project with lots of line learning," Schieffelin said. Awards were presented for Best Actor and Actress, Best Supporting Actor and Actress, and Best Overall Adaptation.